It doesn’t matter how good your secateurs and shears are - if they’re blunt, they’re useless. It doesn’t matter how good your secateurs and shears are - if they’re blunt, they’re useless. Sharpen little and often, and learn to take pride and pleasure in it. Become familiar with your whetstone, don’t think of it as a chore - and certainly don’t get some one else to do it for you! This little bundle is all you need to get started. 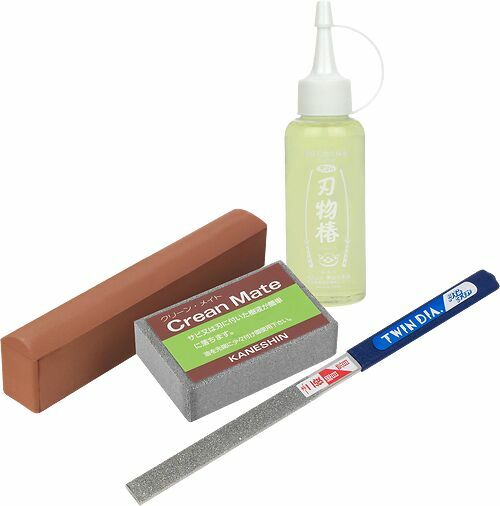 The #1000 Stone is perfect for every day sharpening, while the Twin Diamond File is coarser, and can put a new edge on old, damaged blades. The Crean Mate removes rust, sap and grime, and the Camellia Oil, which we chuck in for free, protects everything from corrosion. Niwaki Tip: This set fits very neatly in the Niwaki Pouch.